Maybe you’re just a secretive person. Or perhaps you are in the middle of leaving your job, and are talking to a boss from a competing company. Maybe you have a girlfriend… and another girlfriend. Whatever the case may be, you don’t want people reading your texts. In fact, when Greg wrote about a guest mode on the iPhone, you basically realized the biggest problem with your phone in that very instant. But there’s a solution, and it’s called Black SMS. There’s one tiny issue I have with the app but none that should hinder anyone from downloading the app if they want to keep their text chats private. Seriously, you don’t even need to read any more. Just download. Here. OK, fine. You want to know more. It’s really simple. 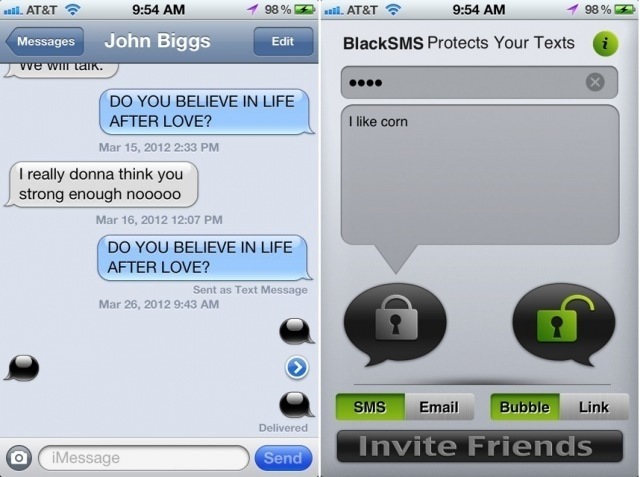 Black SMS is an app that works with iMessage. You simply install and set a password, and then type out your big secret. Once you give the other person the password for your convo (which I recommend that you do over some other form of communication, not text), you simply copy and paste the message from Black SMS into iMessage and hit send. When the text shows up on the other person’s phone, it’ll just look like a black text bubble. The recipient then needs to copy the bubble, switch over to the Black SMS app, and paste the message. The recipient will also need to input the same password you used to encrypt the message. After that, the secret text will appear clear as a bright blue day within the Black SMS app, but anyone who goes snooping in your iMessages app or tries to fake a password will come up with nothing. If you’re curious about the tiny issue, I just wish that there was a more direct way to get back into Black SMS from iMessage rather than multitasking. I use a lot of apps all the time and it’s really easy for an app I used just five minutes ago to get pushed out the multi-tasking bar of four. Still, for $.99 this app is totally worth it. Especially if you creep.